Little spotty on here recently due to me playing fewer games, also I went on holiday. Things should pick up at the end of the month since there’s something like ten interesting games coming out in the space of about three weeks. I’ve resisted talking about World of Warcraft on here so far, except in passing. It’s twelve years old now, and my assumption is that by this point you’ve either played it already, or you are absolutely uninterested in hearing anything about it. Everyone’s going to have formed an opinion on it one way or the other and there’s little that’s useful that I can add to that conversation, especially since WoW’s pace of change has historically been somewhat glacial. New mechanics are added in so gradually that you barely notice how the game changes over time; even though a decade of cumulative additions means it’s a completely different game to what it was on launch, there has historically been very little new to be said about the it. This is precisely why I’m making an exception for the recently-released expansion Legion, though, since it goes against the grain of everything I just said by making changes to the endgame that are downright revolutionary when considered in the context of WoW. I can’t remember another expansion that changed the tenor of the game quite to the extent that Legion does — and certainly not in such a positive fashion. Legion does Blizzard’s usual thing of taking somebody else’s mechanic, polishing it so that it works better than it ever has before, and then putting it in one of their games. What’s a little unusual in this case is that the target for this mechanical larceny is another of Blizzard’s own games: Diablo 3. In this case it’s Diablo 3 after Reaper of Souls and two additional years of improvements that have taken it from the questionable success of launch to the best ARPG ever, bar none, meaning these are undeniably good mechanics to be stealing. In theory the transplant isn’t even that difficult since they’re going from a game that revolves around hitting monsters and getting loot to another game that revolves around hitting monsters and getting loot, so it’s a relatively natural fit — but the catch is that minute-to-minute gameplay in Diablo 3 is considerably more visceral and action-packed than the comparatively sedate pace of World of Warcraft. There is going to be some surgery required to either the stolen D3 mechanics or the inbuilt WoW mechanics in order to make them fit. And the surprising thing about Legion is that Blizzard has decided to change WoW to more closely match D3 rather than the other way around. The headline features of Legion are the same as literally every other WoW expansion: a raised level cap (to 110), a new region of the world to explore, and a new world-ending threat to battle. Most of the playerbase would prefer to forget the time-travel fuckery of previous expansion Warlords of Draenor, and Blizzard appear to be obligingly willing to tie a rock to all of the characters and content introduced in that game and throw it into a river. The sole holdover is that Orc Warlock Gul’dan — a character who got torn to bits by enraged demons all the way back in Warcraft 2 — is now alive and is summoning the Burning Legion to invade Azeroth. Again. 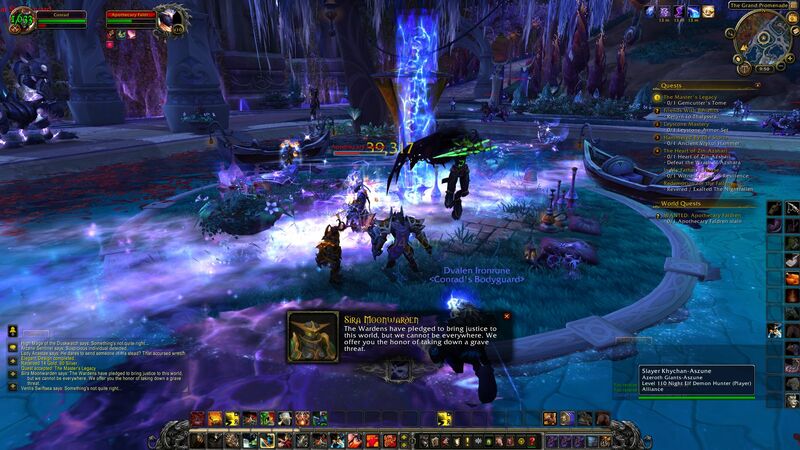 Several major characters who have been around for nearly a decade bite the dust during the expansion’s intro scenario in an attempt to emphasise how serious this particular demonic incursion is, but honestly it’s all a little bit undermined by the Legion being curiously unwilling to expand past the borders of Legion’s new questing zones in the Broken Isles, which is yet another critically important region of the world that everyone conveniently forgot about until it actually showed up in the game1. Still, the quality of WoW’s plot has traditionally been rather dire (although it has individual questlines buried inside it that are top-notch) and I’m not at all surprised that Legion enthusiastically continues that tradition: for all of Blizzard’s feeble attempts to add in a sense of tension it’s ultimately just an excuse to hit monsters, explore dungeons and get loot, and these are the areas where Legion really excels. The experience of questing from level 100 to level 110 is pretty much unchanged: you go to each of the zones in turn and you do the zone storyline and then at the end you get a quest to go inside the zone’s main dungeon to cap the zone’s story off. What has changed is the order in which you do the zones. In all of WoW up until this point zones have had a set level range for the monsters and quest rewards within them. Trying to tackle a zone before you were an appropriate level was asking for a world of hurt as higher-level monsters can one-shot you, and conversely doing a zone after you’d levelled past it was a waste of time since you’d barely get any XP and the quest loot would all be way below your level. This meant there was a very set progression from, say, Westfall to Redridge to Darkshire as you hit the level required to not get one-shotted the moment you set foot inside each one. This is actually a good thing when you’re dealing with players who are just starting out as you can properly structure the introduction of mechanics and questlines that overlap multiple zones, since you know which order they’ll likely be visited in. It’s a distinctly bad thing when you’re doing it to players who have spent hundreds or even thousands of hours in-game, however, as they’ll level through whatever content you’ve set out for them relatively quickly and then spend the entire rest of their game time in whatever the max level zone or dungeon is since doing anything else would be a colossal waste of time in terms of improving their character, and the “levelling” zones end up being incredibly sparsely populated while 90% of the playerbase is crammed into one relatively small area. Legion’s solution is the same one that Diablo 3 implemented so effectively: it scales the level of the Broken Isles zones and the monsters within them to match the player’s own level. This means you can go anywhere in Legion at any time and be assured of both a decent level of challenge and an appropriate reward for the exercise in button-mashing that is WoW’s combat system. Players being able to do zones in any order does mean that individual zones are absolutely standalone with no crossover from zone to zone, which is a bit of a shame — since the hub area for this expansion is the floating mage city of Dalaran (they moved it from Northrend where it’s been chilling for the last eight years) even the breadcrumb quests to visit a zone for the first time mean you fly in from Dalaran rather than travelling via a road, which adds to the general disconnected feel of the Broken Isles as a whole. Still, it does undeniably solve the population problem: you can go anywhere in the Broken Isles and you will always see a lot of other players going to those same places and doing those same things. This would be annoying if Blizzard hadn’t finally – finally – gotten rid of the antiquated monster “tagging” system (where hitting a monster first effectively assigned it to you and meant that only you could loot it), making the presence of other players a good thing as you don’t need to be in a party to get loot and/or quest credit for killing things any more. Yes, Guild Wars 2 already did this four years ago, but it’s nice to see WoW belatedly catching up. These changes are powerful on their own, but they’re arguably just sub-components of the most obvious D3 mechanic that’s been crammed into Legion’s endgame: World Quests, which are Diablo 3’s Bounty system by another name. 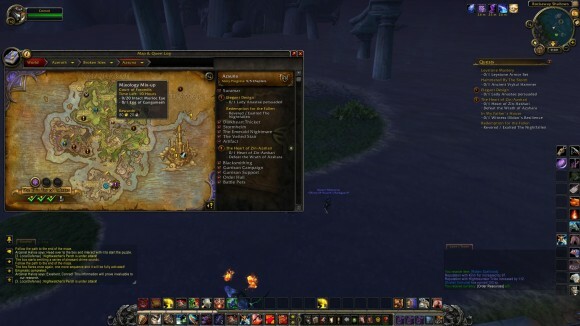 The way these work is that once you hit the expansion level cap of 110 you’ll suddenly start seeing yellow exclamation marks pop up all over your map, each of which denotes a World Quest. These are almost all styled after quests you do while levelling so the actual content of the World Quests isn’t anything particularly special, but most of them can be knocked off in five minutes or so and there’s a fair chunk of variety. That last point is important as they’re all on a timer (usually 6, 12 or 24 hours) after which uncompleted quests drop off the map to be replaced by new ones. There’s about 30-odd quests active at once out of a pool of… oh, about 200 or so? And this constant cycling of quests on and off the map means that you’ll be confronted with a mostly-new set every day no matter how much you play and you can pick and choose which ones you want to do depending on what your goals are. Perhaps you need some resources for your class Order Hall — a very-scaled back version of Warlord’s Garrisons and far better for it — and so you’ll zoom around the map hoovering up the quests that award Order Resources. Or you’re taking the long-term view in picking up reputation with a specific faction and doing all of their quests for the reputation rewards. Unusually for solo PvE2 content World Quests can reward Epic-quality equipment, so if there’s one of those on the map that offers an upgrade from what you’re currently wearing you’ll probably beeline straight for it. There are any number of reasons to engage in World Quests, and this along with the variety makes them a huge improvement over WoW’s previous evergreen content system of Daily Quests. So PvE questing past the level cap is finally rewarding in comparison to the usual endgame activities, and for this alone I consider Legion a massive success since the level cap is where players spend 99% of their time in WoW. Most of the other changes it makes are evolutionary rather than revolutionary. 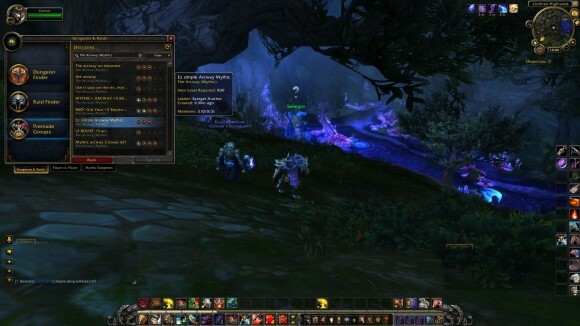 For example, the new Artifact Weapons look like they’re going to have a huge impact on how WoW plays; getting a new weapon used to be the single most significant upgrade you could achieve for your character, so starting all players off with something that is already the most powerful weapon available in the game would appear to be counterproductive, as well as potentially gamebreaking. There’s method in the madness, however, as the Artifact Weapons being handed out as part of Legion’s main questline means it can be balanced around the player always having one. Effectively all it does is remove the distorting leapfrog effect weapon upgrades had on the game and limits character improvement to the more incremental passive stat bonuses offered by increasing the item level of your armour. Each Artifact Weapon has its own experience track which is used to gradually improve the weapon by investing in what amounts to a weapon-specific talent tree, and filling this up is meant to be one of the main driving forces behind the endgame; in my experience it’s just happened naturally as I’ve been doing other stuff, though, and while the weapon talents are useful they’re not game-changing enough to be worth focusing significant amounts of effort on. Artifact Weapons are an intelligent addition that streamline the endgame rather than turning everyone into overpowered murder machines, and the same is true for the changes to the skill system. I play a Warrior (because if I have to be a fantasy character I’m going to be the one that charges full tilt at the enemy and smashes them in the face with a shield while screaming at the top of their lungs) and can’t really speak for how the other classes have panned out, but the Warrior’s skills have been brutally pared down to just five or six actively used skills per class specialisation, plus another 7-8 that are either situational or are on long cooldowns and only used as a last resort. It’s not quite as simple as Diablo 3’s six skill slots, but it feels a damn sight more manageable than the skill spaghetti of pre-Legion WoW; each specialisation’s skill rotation is easy to get the hang of, and mastering it becomes a matter of learning when to do the additional situational stuff. Talents have also become somewhat more like D3’s runes, in that you pick one of three different modifying effects per talent slot and can switch them around as much as you like just so long as you’re in a city or an inn at the time. Best of all is that the Glyph system has been jettisoned into the sun, which is good because I never really understood the bloody thing and it was just making things unnecessarily complicated, and stripping out unnecessarily complicated game mechanics seems to be the theme of this expansion. Thanks to these changes I actually understand how to build and play a character instead of being so overwhelmed by all the different elements that I just don’t bother with half of it, and combat also seems punchier now that each class has six abilities that all smash an enemy in the face for massive damage. It’ll never be D3 levels of visceral, but honestly I think this is about as close as World of Warcraft is going to get to that ideal while still remaining WoW. Since I’ve spent 2,000 words throwing superlatives at World of Warcraft – a game I had previously classed as the dictionary definition of “guilty pleasure” — I should, for balance, mention that for all the smart mechanical changes that have been made there seems to be somebody on Blizzard’s design staff who really misses the days when people had to manually form their own dungeon groups by spamming LFG or similar. This person is an idiot since the experience of spending an hour to get a group together and travel to a dungeon is not something I particularly wish to repeat — especially now that item level is surfaced in such a big way — but unfortunately they’re on the design staff and I’m not, and this explains why Legion’s Mythic level dungeons are so incredibly stupid. For some context, there are three difficulty levels for dungeons in WoW: Normal, Heroic and Mythic. Increasing difficulty meant tougher, more complicated baddies, but also better loot, so obviously everyone runs the hardest difficulty they can cope with. If you’re playing a Normal or Heroic dungeon you get to take advantage of WoW’s automated Dungeon Finder, a mechanism that I regarded with childlike wonder when I first encountered it since it made doing a dungeon so goddamn easy compared to the hoops you had to jump through before. In the Dungeon Finder you just select a role you’re willing to play (Tank, Healer or Damage) and the dungeons you’re interested in doing and press Go, and the Dungeon Finder will then try and match you with an appropriate dungeon group. It’ll do this in the background so that you can get on with some light questing while you’re waiting, and when your group is ready you just accept the pop-up message and get instantly teleported into the dungeon with your group. 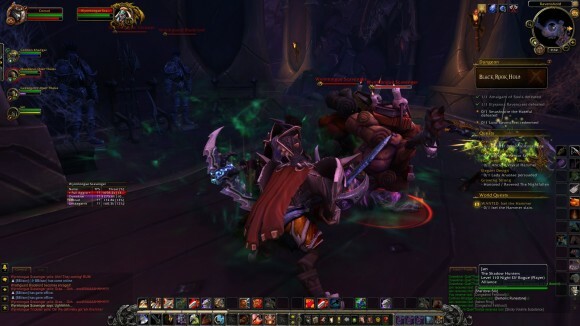 It is simple, it is painless (as long as you don’t mind the queue time), and it is exactly what WoW needs to make dungeons viable in TYOL 2016. That is, unless you’re playing a Mythic level dungeon, in which case you don’t get to use the Dungeon Finder. 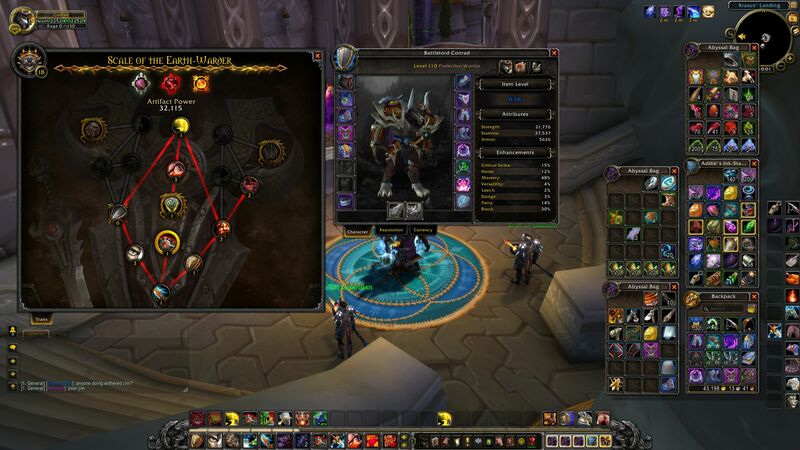 If you want to do a Mythic dungeon you must instead revisit the bad old days of LFG — or at least the 2016 equivalent, which is something called the Group Finder that essentially acts as a bulletin board for posting dungeon group ads. Because Mythic dungeons are quite difficult, and because the people who run Mythic dungeons are generally the sort of childish asshole3 you’d expect to find in what is still the world’s largest subscription MMO, your chances of actually getting into one of these groups without either an item level that’s at least 10 more than what’s actually required to do the dungeon or an achievement that proves you already did it are precisely bugger all. Usually this would just mean I don’t bother with Mythic dungeons (I believe they were present in Warlords of Draenor but I just ignored them), but unfortunately yet another of the things Legion steals from Diablo 3 are Greater Rifts, which have been rebranded as Mythic+ difficulty. Just like rifts you need a keystone, and just like rifts Mythic+ dungeons have numbered levels of difficulty that offer increasingly better rewards. I understand there are some subtle differences between Greater Rifts and Mythic+ dungeons, but I don’t know what they are because I have, to date, been completely unable to get into a Mythic+ group via the Group Finder. Apparently I missed the two-day window immediately after launch when everyone was gearing up and learning the dungeons and now I’m expected to have done at least one thousand runs of each dungeon before Mythic+ groups will even consider letting me in. This is exactly, exactly what I expected to happen when I heard about the Group Finder, and even considering that Mythic dungeons might require a more nuanced group setup than the Dungeon Finder can provide I’m really surprised that Blizzard thought this was a good solution. That’s about the only wrong step that Legion makes. It is sadly a step that effectively locks me out from a fair chunk of endgame content, and I’d probably be far more annoyed about it if I took item level seriously at all. Fortunately I don’t; I’ve always been more about exploring and questing in WoW than I have been watching a number go up, and so while I’m a bit put out that I probably won’t get to see what Mythic+ dungeons are like it’s relatively easy for me to let it go, especially considering the vast number of good things Legion does to revitalise a game that had been on the slide for a while. 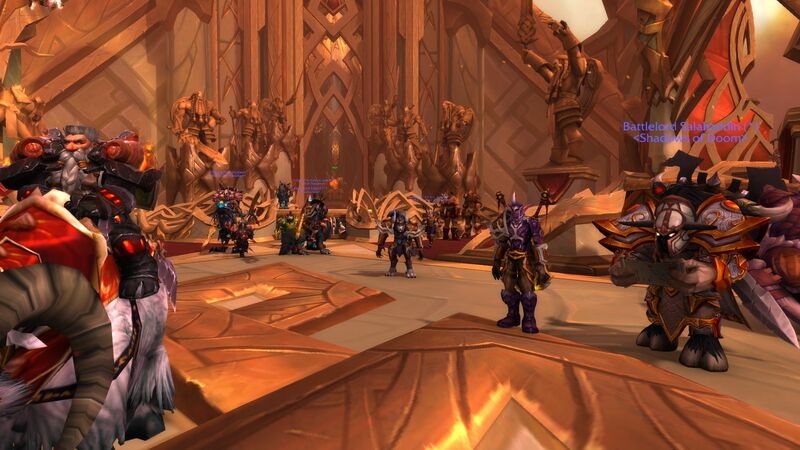 For all of its improvements I don’t think it’ll change anyone’s mind on WoW as a concept – if you already liked it you’ll probably love Legion, and if you already hated it Legion isn’t going to cause you to undergo some kind of Damascene conversion — and so this review is more of a historical marker of how willing Blizzard are to make drastic alterations to the fundamentals of WoW to ensure it stays relevant. Or, at least, that its inevitable decline is a managed one. World of Warcraft might be over a decade old, but if subsequent patches and expansions are delivered with even half the imagination of Legion then it still has a good few years left in it yet. My eight year old daughter has just started play WoW. She is a level 9 priest and has recently killed Hogger. I am so proud.